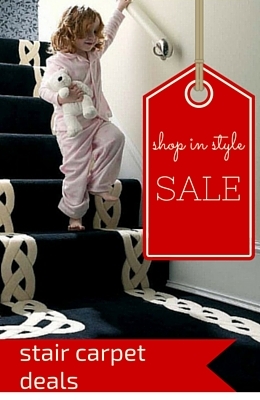 Floor Designs love selling Karndean & Amtico design floors around Central Scotland in the areas of Glasgow, Edinburgh , Cumbernauld, Falkirk, Stirling and Perthshire .We’re a specialist in giving great advice, explaining all the benefits, giving you the best options for your budget.Our installers are second to none and we simply love luxury design flooring! This customer came to Floor Designs Falkirk looking something different, exploring all the possibilities of wood flooring, laminate, Karndean and Amtico Flooring Tiles that would work well with their newly fitted Kitchen. They were looking to for something that would work well in their dinning room and flow between the two room. There main concern was that the Kitchen subfloor was concrete with terezo vinyl tiles that were stuck solid in most areas whereas the dining room subfloor was floorboards with hardboard on top. 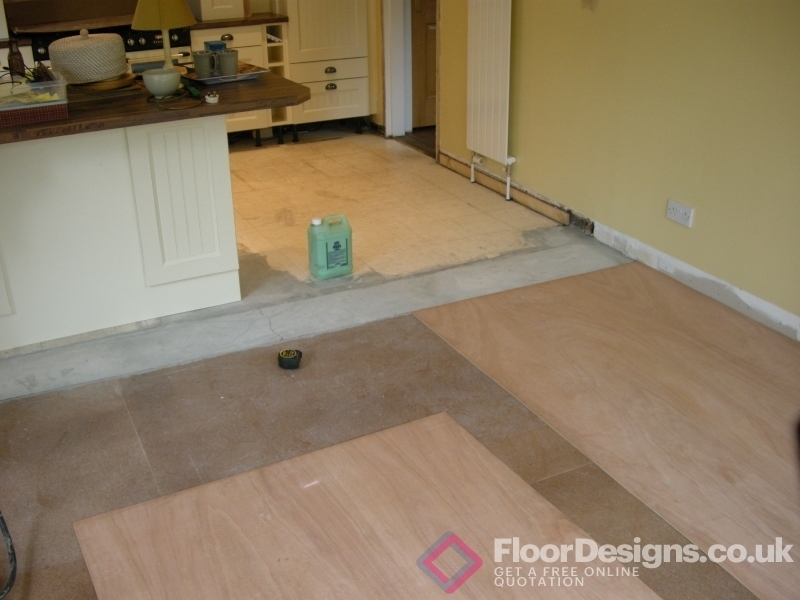 The first stage was to prepare the dining room area using 6mm plywood and then the Kitchen was then primed before a thick screed was applied which brought the Kitchen floor level with the plywood in the Dining Room. 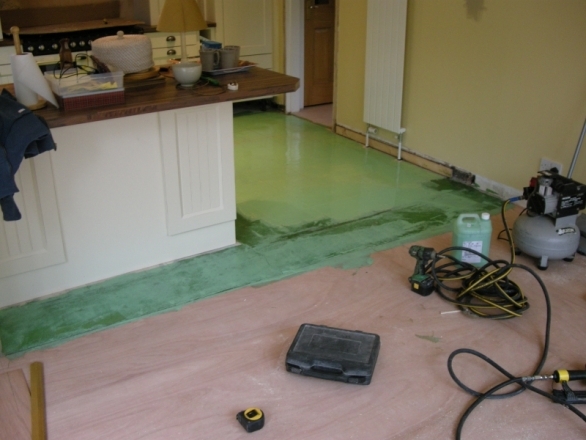 Once the screed was set, both areas were primed before a special flexi screed was applied over both the plywood and screed in Kitchen. This is basically a self levelling compound that allows Karndean and Amtico fitters to screed over various types of subfloors including plywood, leaving an ideal surface to install Karndean and Amtico Flooring. 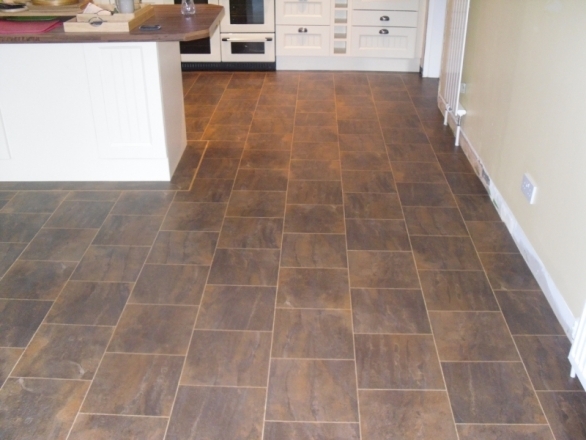 The kitchen units were white with a Solid Hardwood Walnut worktop, Floor Designs helped them choose the T102 Ramsey tile from the Karndean Knight-Tile Range. This really tied in well with the dark walnut worktops and created a sharp contrast next to the white units. 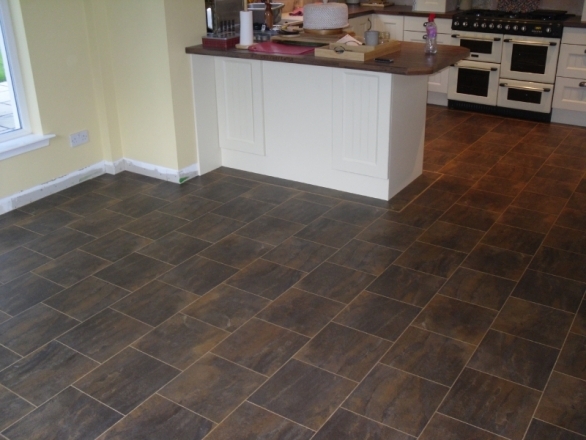 In between the tiles they a Karndean 3mm KP40 American Oak strip as it tied in well with their oak skirting, facing and doors. 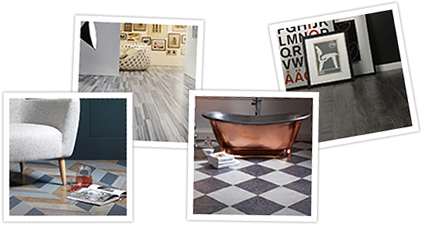 One of the great advantages of choosing Karndean and Amtico flooring is the flexibility of designs that can be created. The customer wanted the two areas to flow but at the same time they wanted to subtly break up the units from the dining room area.. In the end Floor designs suggested using a slightly wider Karndean 10mm KP40 American Oak Design single line border around the perimeter of the main units to break the two areas up. As the area was fairly large it was decided that the main tiles would be staggered on a brick effect design. 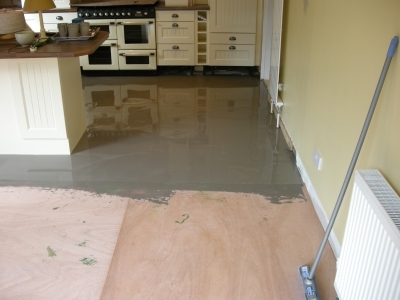 The whole design came together very well and really complimented the newly fitted Kitchen.